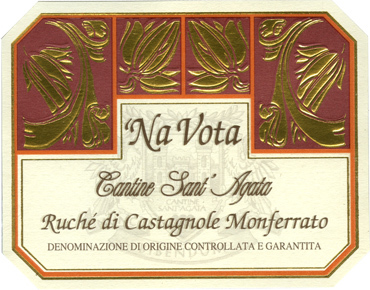 ‘Na Vota is elegant red in color. Aromas of violet, hay, and vanilla appear on the nose and follow through to the palate. It is complex and well-structured with a long aromatic finish. Ruche’ will pair well with hearty dishes such as braised lamb, game, mushroom risottoand also spicy dishes. In Piedmontese dialect, the expression “ ‘Na vota” has a double meaning: it is the beginning of many fairy tales such as “c’era una volta” (once upon a time); and also it can be interpreted as a challenge. Ruchè is a variety of Piedmont that has risen from virtual obscurity as a little-known, dark-skinned variety to having its own appellation, Ruche’ di Castagnole Monferrato, elevated to DOCG status in 2011. Its origins are disputed, with some claiming Ruchè as indigenous to the region, while others claim it has Burgundian roots. Destined for family consumption in the past, it was the wine of ‘important occasions’, offered to the nearest and dearest, always associated with life’s beautiful moments. Vinification in stainless steel for approximately 6 months, and then the wine is bottled.